After a long, cold, wet winter, I am really digging the warmer spring weather that finally got here. Last week I enjoyed several longer walks with a lot of spirited fetching mixed in, punctuated by frequent stops to sample the unbeatable salad bar offerings in the South Meadow. And I could really tell that spring had sprung when all of Heather’s new tulips burst open at the same time as the azaleas in the front yard. Heather has received many well-deserved compliments. Ron and Cathy on a previous visit. During our first hot spell my Alaska pals Ron and Cathy visited for a few days on their way back to Juneau. By now I have them so well-trained that I don’t even have to remind them where the downstairs treat container is. They just know. I made sure to spend a lot of time downstairs while they were here. The Sunday after they left, Mike and Heather took me on a walk with my pal Charlie at Carkeek Park, where I have a few special places for fetch that are second only to my personal trail in Discovery Park. Unfortunately, all my favorite spots were in use when we arrived at them. Along the trail to the salmon-raising area, instead of throwing the ball I was forced to listen to a knowledgeable volunteer explain the salmon-rearing process. Heather actually fed the salmon fry right in front of me while I sat there, eyeing all the fish and starving. Later, still brimming with my unreleased springtime energy, I dragged Charlie, Mike and Heather up and down some of the steepest trails in the park before enjoying a brief respite in the blooming fruit tree orchard another quarter-mile further up Piper’s Creek. Mike made a couple of half-hearted throws for me before deciding the tall, unmowed grass could eat my ball at any moment. Can’t say I could disagree. Anyway, we had a great walk that afternoon, and before I went back to the car Mike served me dinner al fresco, a perfect ending to a perfect day. 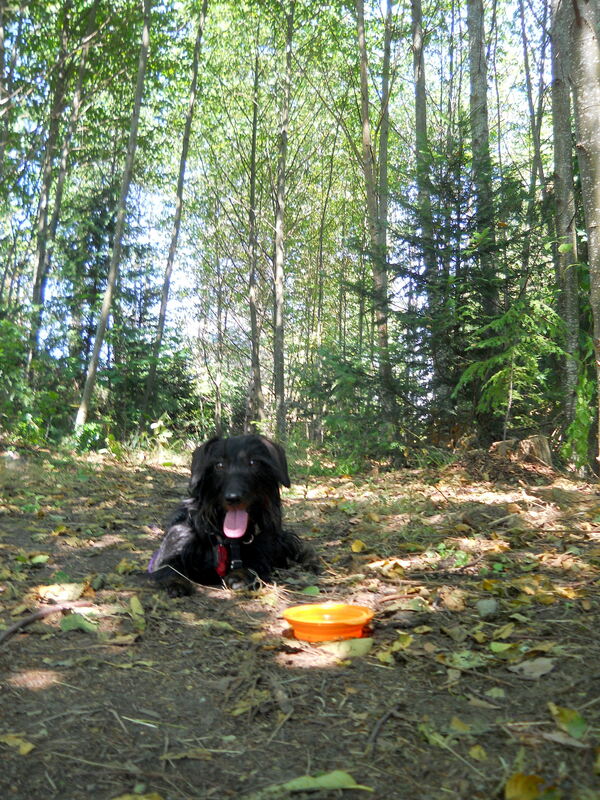 My friend Penny’s back in Seattle for a few months after her summer in the Adirondacks. Two Saturdays ago, she came over to my house for a football game , and last Saturday we went over to hers. The Syracuse football team was routed both times (and pretty much whenever it plays, to tell the truth), but it’s always a lot more fun for me when we go over to her place. I get tired of playing around with Penny pretty quickly, but she has a great toy collection for me to rummage through, and another long, dull football game is plenty time enough to examine every single one. Wrestling with Penny and going on walks around the neighborhood with her is OK, but I’m much more interested in those toys. And the carpet. I can never get too much carpet. My Alaska pals George and Debbie came with us to Penny’s house, apparently because they share an allegiance to the Orange Nation (class of 1972). George and Deb stayed at our house for one night before flying to Europe. I was sorry they couldn’t stay longer, because they paid a lot of attention to me. They quickly picked up my visual and aural cues to find my downstairs treat container, too. Being dog owners themselves, however, they broke the biscuits in half before bestowing them, which was of course totally unnecessary. No need to skimp down here in the Lower 48. 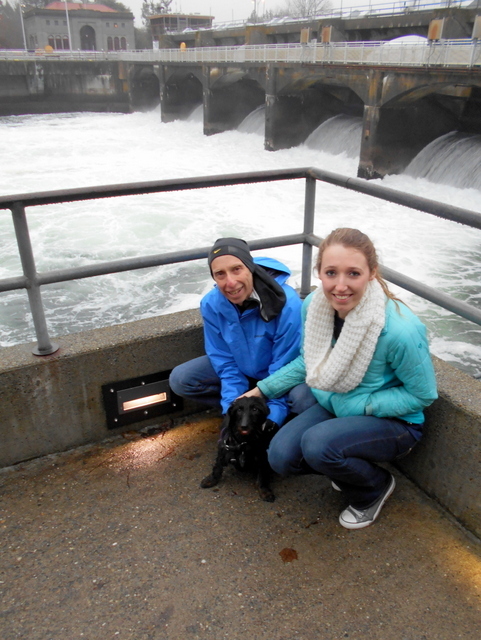 I’m still holding out hope that Mike and Heather will take me with them when they go up to Juneau for a visit. I want to commiserate with George and Debbie’s dogs, Max and Bob, and both of them are getting on in years. Mike and Heather have discussed it, but they are reluctant to take me on a plane, having heard horror stories about stranded and stricken dogs on planes and tarmacs. I’m torn on the subject. Penny flies on planes all the time, and she’s not complaining. But she’s a lot tinier and more docile than I am, however, so she gets to fly in the cabin with passengers, not with the freight and luggage. Steerage is not my style, and there’s no way I’m going on an intense weight-loss program just so I can squeeze into an under-seat carrier. So pass me those treats, please. Whole ones! I haven’t yet had the privilege of visiting “back East,” which is where Mike and Heather came from, long before I was born. But everyone I meet from “back East” is so much fun, I can’t wait for a chance to get there. Heather has told me many times that she’s going to take me there “after I retire,” whenever that may be. Everybody I’ve met from “back East” is so nice to me. My latest visitors were Gary and Cindy, who came from Boston to go to a wedding near Seattle. Gary and Mike have known each other since the Seventies in Syracuse, many dogs ago, and they have remained close friends. He and Cindy stayed with us twice, at both ends of a week-long cruise to Alaska prior to the wedding near Seattle. In fact, the day they came back we took a walk and we could see their cruise ship sail past the viewpoints in Discovery Park. The first part of their visit was too much of a whirlwind for me to make much of an impression on them. It was a record hot day in Seattle, and so I had to stay home, unable to sit on their laps during Mike’s official auto tour of the city. 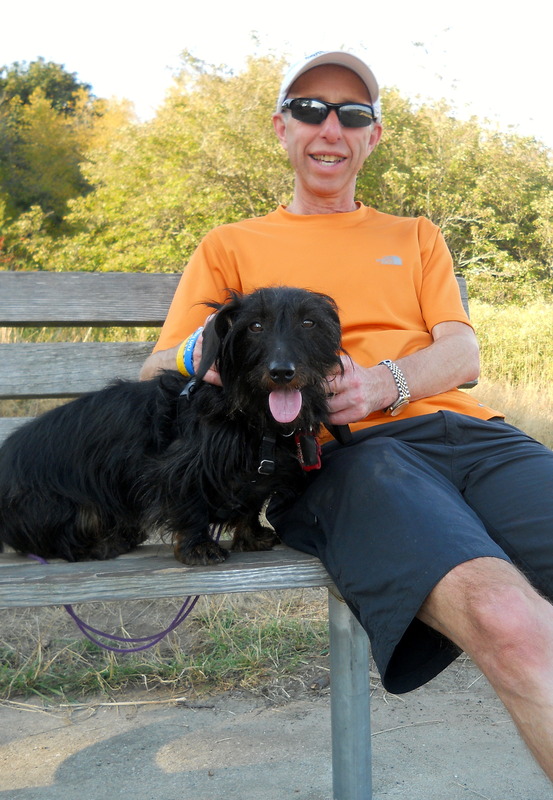 On their return visit, however, I had two whole days to teach Cindy the whereabouts of my downstairs treat container, and I got both of them to walk with me all the way down to the Ballard Locks and back, which was a lot more exercise than they got on that cruise ship, I’m sure. We were out walking almost three hours that afternoon, and trust me, there was no all-you-can-eat buffet laid out when we got back to our house, either. Gary and Cindy more than coped with all the hardships; they had smiles on their faces the whole time they were here. I could tell they were OK people when they picked me up to pose for their official Chloë Visitor Portrait without regard to the fancy duds they were wearing for the wedding. I approve! I just hope they come back before that downstairs treat container is empty. Among my many pals from Alaska, I see Cathy and Ron the most. They have pretty much become part of my pack, like Lynn and Charlie. In fact, they had visited us just a few weeks ago, so when they showed up again I figured they missed me so much that they decided to come back quickly. But the morning after they got here, Cathy left for a few nights, and every night Ron came back to the house late, looking very tired. Then Cathy returned, but I could see right away that she was hurting and probably needed to stay in bed for a while. That’s when I realized I could really help her out by snuggling close to her in her bed and in front of the fireplace, which was turned on a lot, just the way I like it. And it didn’t take me long to train Ron about the treat container by the TV set. Whenever I stared at it, he got the message. Ron walked in the park with Mike and I a few times. One day in the pouring rain, he recaptured me when I sprinted off from the parade ground to chase a fat gray rabbit behind the housing-renovation area. Ron cornered me in about two minutes; it would have taken Mike a half hour at least, maybe more because it was raining so hard. I was good after that. Cathy has Chloë eating out of her hand. A few days later, Mike tried to get me to pose with Ron and Cathy for one of my patented Visitor Portraits, but I was far more interested in chomping down the black compost that’s been covering the front yard for about a week. Yum and um! Heather had been wondering why my poop was black, and now it’s apparent. No big deal. Mike can feed me something in tan to even things up before St. Patrick’s Day. I obviously did a good job nursing Cathy back to good health, because by the time she and Ron left a few days later, she was already able to walk in the park with us for more than an hour. I had a great time while they were here; something good was always happening, and even when I was left home for a while, I got another Wobbler to knock around. In fact, for a couple of days after Ron and Cathy left I kept looking for them in the downstairs bedroom, all for naught. Now it’s back to boring Mike and his NCAA Tournament bracket. After spending some slow vacation time with my Chloë Care Team (that would be Lynn, Charlie and Jill) while Mike and Heather were away for a week, my life turned into a social whirlwind as soon as they returned. Heather’s sister Annabelle drove down from British Columbia for the weekend, and two of Heather’s cousins came dinner on Saturday. Not only was it a Tully Family Reunion (held last July) all over again, but it also gave me a chance to connect with several of my regular readers at one time. I reveled in the attention. Chloë greets loyal readers Charlie, Heather Sue, Annabelle and Pookie on the steps of the Headquarters Building in Discovery Park, Seattle. Heather’s cousin Pookie lives in Montana and Cousin Sue in Oregon, and they were visiting Seattle for the annual Northwest Flower and Garden Show. Heather and Annabelle were planning to join them at the show on Saturday, but then Annabelle’s car started making funny noises and she had to deal with that instead. Just as well, as I got to spend the whole day with Heather, always a treat. Besides, Mike was at Scott’s house to watch his basketball game, and it’s always pretty boring there. In the late afternoon, cousins Sue and Pookie joined Heather, Annabelle and my regular weekend walking partner Charlie for a stroll in the park, giving me a good chance to mingle with my fans. Mike had to stay home and cook dinner, and because of the ample company I had with me, that was a much more efficient use of his time. It paid off, too, as Mike’s Greek Chicken with Red-Skin Potatoes was a big hit at dinner and yielded enough plate scrapings to enhance my twice-daily kibble for three weeks at least. On top of that, cousin Sue brought me meat loaf; I got a few mouthfuls after Mike and Heather ate most of it. And then this: Right on the heels of discovering a painting of a dachshund that resembled me in a San Francisco restaurant, cousin Sue revealed that she also has a dachshund named Chloe (where’s her umlaut?). A couple of days later, she sent a picture. What’s going on here! How come these other dachshunds get professional portraits and I don’t? Am I supposed to live my whole life settling for middling photography from Mike to chronicle my existence? Not fair. Just not fair. I deserve Annie Leibovitz at the least. Look at that face. I am looking forward to a big year in 2015. My nose is already perking up with the possibilities. See, when Mike reordered my monthly flea-worm medication (a little pill that tastes like liver! )he needed to buy something else to push the cost high enough to get free shipping. 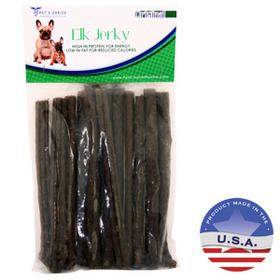 Mike can’t resist a bargain, so he searched the site quickly and ordered me some elk jerky. Well, I haven’t exactly gotten any elk jerky yet. But I know it’s in the hall closet because I can smell it—the sweet smell of success, as far as I’m concerned. Although the disappearing Great Dane Titan has not resurfaced, I have recently renewed acquaintances with Bingo, who lives in the park’s Officers Row, and Molly, a curly black cockapoo who I knew when we were puppies around the same age. We hadn’t seen each other in years, and I was excited to see her…for about 15 seconds. The thrill was gone. I was a bit more interested in Bingo, who held my interest for a minute or two. Bingo wanted to play, but frankly, I’d rather fetch my ball with Mike. No offense or anything. I like Bingo, I’ll give him a wag, but I’d rather play by myself and be with my pack. Heather has determined that I consider my pal Charlie to be a member of my pack, because he lived with us for a while last fall. I recall it was only a couple of days, but maybe it was longer; remember, I only live in the moment, so it’s hard for me to keep track of time. Heather says this level of bonding with Charlie explains why I go so wild when he comes over to see me, whine every time he leaves the room, and jump up on the furniture to sit in his lap. In reality, it’s just that I know Charlie will give me treats and rub my head and ears to my heart’s content. Charlie’s daughter Elise visited him last week and came over for a visit. She goes to school in Atlanta, Ga., and I had never met her before, but I knew she must be OK even before she arrived because she is a subscriber to this my blog, and all my subscribers are extraordinary people. So I took her and Charlie on a long walk through the park and the cemetery and all the way to the Ballard Locks, where we watched boats locking through and crossed over into the botanical garden on the Ballard side. Elise seemed to enjoy it, even though it was pretty chilly. I didn’t get to stay with her very long, but I definitely liked Elise, because I could tell she is a genuine dog person. 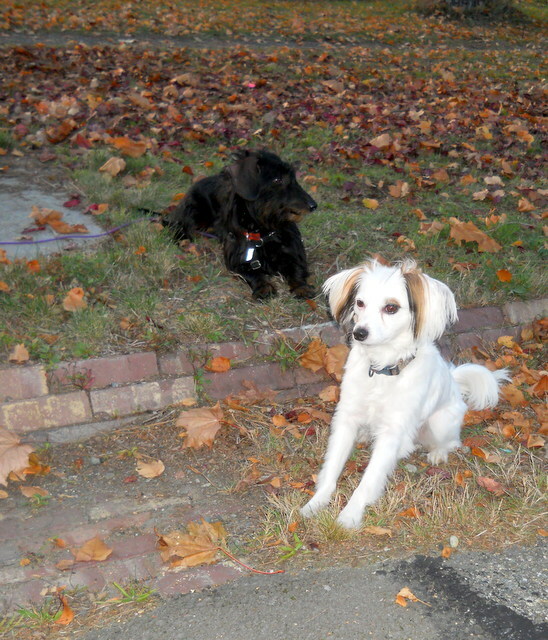 Besides, I know that Charlie loves her, and since Charlie’s an official member of my pack, so we’re almost sisters. I hope Elise comes back again in the summer when the weather’s a little better, and I can take her to some of the really neat places I know out on the OP. I met Charlie, a friend of Mike and Heather from back in Syracuse, a few weeks back, but at the time I had no idea he would come back again so soon. Apparently he got the job he was interviewing for that day, moved to Seattle, and will be staying with us until he finds an apartment. He better find one that allows dogs, because I plan to visit. I could tell from the first time I met him that Charlie is a dog guy: He knew exactly where I like having my head rubbed, and he did it for a long time. Here’s what a dog guy he is. Since he didn’t know that UPS is my preferred package delivery service. he shipped his stuff here on competitors; I won’t embarrass them by printing their names. The packages arrived, and each time I got excited in vain: No UPS, no bickies. However, as soon as Charlie learned that he had made a faux pas, he pledged to buy me a whole box of biscuits to make up for it. I’m still waiting for that delivery, but it’s only been a day, and Charlie also had to start his new job at the daily newspaper and look for an apartment, so I’ll cut him some slack. I want to stay on his good side, just in case he can give me an inside track to syndicate my blog posts to other markets and platforms. Until he started working, Charlie came along with Mike and I on our afternoon walk. Charlie is trying to get used to the park’s geography, so I am showing him around the nooks and crannies of the trail system. He quickly put my lessons to use, running the whole Loop Trail twice in about 45 minutes one morning. Yikes, that’s more than five miles, with lots of hills. I later heard him tell Mike that he sometimes takes his Jack Russell terrier Logan running with him (Logan lives in what we call “the other Washington”). I never thought I’d be saying this, but thank god I just have to put up with Mike’s demands on my fitness. I realize now that things could be worse. In fact, at dinner on the evening we shot the video, Charlie couldn’t stop gushing about how amazed he was. However, one aspect of his otherwise glowing comments rubbed me the wrong way. He referred to it as my “trick,” and he advised Mike to try to get me on Dave Letterman’s Stupid Pet Tricks. But that’s selling me short. This is no trick, it’s skill, pure and simple. And I may be just scratching the surface of my potential. Maybe I’ll run off and join the circus. or replace Derek Jeter. I’m a work in progress. Excelsior!